In humans, Vitamin C is a highly effective antioxidant working to lessen oxidative stress, neutralize pollutants and thus strengthen the immune system. It also acts as a substrate for ascorbate peroxidases (enzymes that detoxify peroxides such as hydrogen peroxide), an enzyme co-factor for the biosynthesis of many important biochemicals and it is an electron donor for 8 different enzymes. In addition, C helps make collagen, a tissue needed for healthy bones, cartilage, teeth, gums, skin, and blood vessels; it also thins the blood. This vitamin is essential in sperm production and has been shown to lower intraocular pressure (IOP) in glaucoma patients when taken in massive amounts according to the September 2007 issue of GLEAMS (the newsletter of the Glaucoma Research Foundation). C cannot be advised as an alternative glaucoma treatment due to undesirable side effects of mega dose supplementation with the C vitamin (see "Toxicity" below). The Institute of Medicine's current recommended dietary intake for vitamin C is 90 mg for men and 75 mg for women (add an extra 35 mg for smokers). These recommendations are set very low and are believed to only prevent scurvy, a disease that results from vitamin C deficiency. The upper limit is set at 2,000 mg (2 g) per day. There is no good scientific evidence that mega doses of C improve immune health. As the evidence continues to unfold, 300 to 500 mg a day appears to be a reasonable target and is easy to achieve with a good diet. Glutathione helps maintain the C vitamin and lower the required intake by recycling it. The recycling occurs after the C vitamin has neutralized a free radical by giving up an electron to the free radical. GSH in turn gives up an electron to the C molecule, retuning it to work as an antioxidant. While glutathione recycles vitamin C, in its turn vitamin C is able to improve glutathione levels and stimulate glutathione’s activity as has been demonstrated in numerous studies. One human trial led by C.S. Johnston at the Arizona State University and published in the American Journal of Clinical Nutrition in 1993 showed that vitamin C was able to elevate glutathione levels in red blood cells by nearly 50% compared to baseline after daily supplementation with 500 mg for 2 weeks. Individual results among the participants of this study ranged from modest 8% to significant 84%. It is important to note that a high dose group that took 2,000 mg of vitamin C a day did not exhibit better results than a 500 mg group. 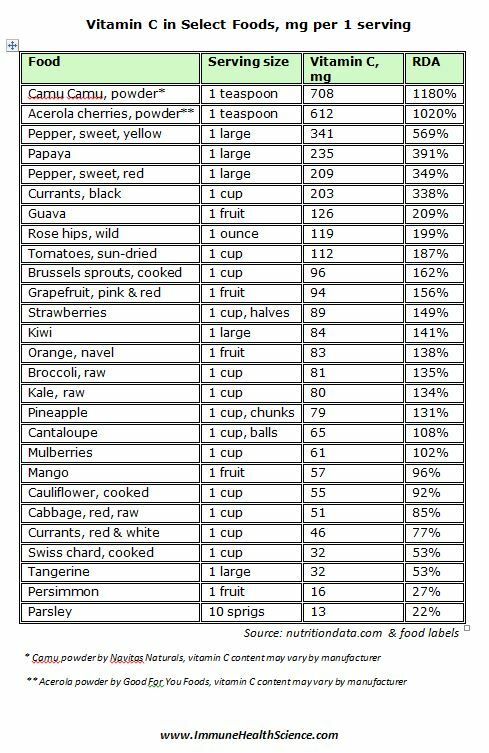 The best food sources of vitamin C are presented in the table below. Note: this table is a .jpg file. Feel free to save it for future reference. For the complete list of foods and Vitamin C content in them click here. Two extraordinary sources of vitamin C, unfortunately not available in the North America or Europe in their fresh form, are Kakadu plum and Camu Camu. 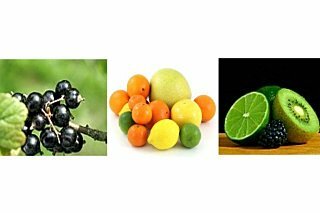 Kakadu plum has the highest known C content, 3,100 mg/3.5 oz (100 g), that is over 5% C by weight - 60 times the concentration found in oranges. Camu Camu contains the second highest known content, 2,800 mg/3.5 oz (100 g), that is 2-3% of its fresh weight. Kakadu plums are native to Australia and Camu Camu is a native of the Amazon rainforest. On the US market Camu Camu is available in dried powdered form and as an ingredient in antioxidant juices which can be found at health food stores or online. The human body only can store a certain amount of C. If fresh supplies are not consumed regularly the body soon depletes itself of this necessary vitamin. The presence of large quantities of sugar either in the intestines or in the blood can slow the absorption of C. The deficiency causes scurvy and makes a person more susceptible to cold and flu viruses. Nobel prize winner Linus Pauling (1901-1994) and Dr. G. C. Willis have concluded that chronic long term low blood levels of vitamin C or chronic scurvy is a cause of atherosclerosis. C exhibits extremely low toxicity. However, very high doses (thousands of milligrams) may cause indigestion, diarrhea and skin rashes. As C enhances iron absorption, iron poisoning can become an issue to people with rare iron overload disorders.